Soft Leather; leather sole, wrapping straps closure, no appliqués, round toeline, leather, solid colour, leather lining. Soft Leather; flat, round toeline, lacing, leather lining, sueded effect, solid colour, leather sole. 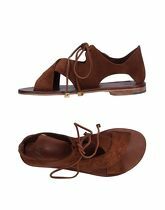 Heel height 1.95 inches; Soft Leather; leather lining, solid colour, sueded effect, round toeline, leather, no appliqués, square heel. Soft Leather; leather sole, round toeline, solid colour, flat, no appliqués, wrapping straps closure, leather lining.